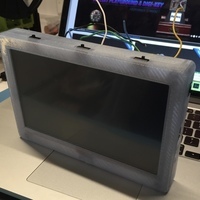 Summary Remixed the case for the Adafruit 7" HDMI Touch Enabled Monitor -- makes use of a spare camera LiPo. Adafruit has a 5" version they run off of a camera LiPo and a 7" version they run off their own battery pack. 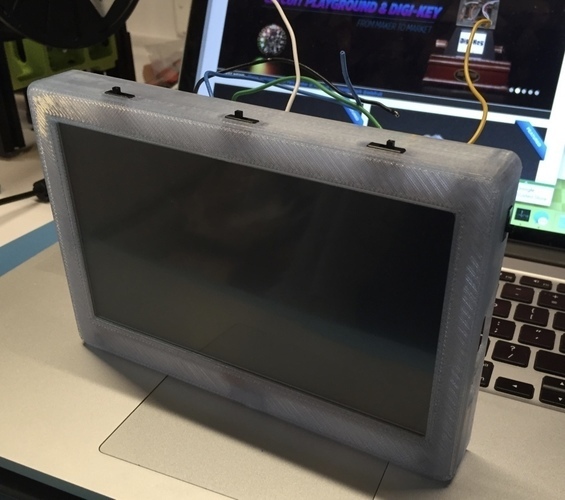 This case is a mix of the best of both of those project plus some fine grained control over backlight brightness. Print Settings Printer Brand: LulzBot Printer: TAZ 6 Rafts: No Supports: No Resolution: Standard Infill: 20% Notes: Printed with a brim to minimize warping. Used translucent blue PLA since I wanted to show off the electronics and self built nature of this project. I printed it with supports because the power switch holder is much higher than the other switches and I didn't want it to droop. Was easily removed and worked out great. Post-Printing Removed brim and any supports How I Designed This Using the battery holder dimensions from the STLs for the 5" screen I was able to modify a version of the 7" case back to have the same holes for the Canon LP-E6 battery holder and a hole for the wires to pass through. I also doubled the thickness of the case back as the original 7" back was too thin/flexible for my liking. 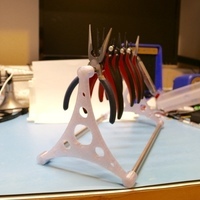 The extra stiffness helps the battery holder stay securely fastened. I also deleted the screw stand-offs for the PowerBoost board that is not needed for this remix. For the case top I added 2 more switch holders so each of the hacker points -- 50mA, 50mA and 25mA could be toggled separately. I also removed the large hole for the PowerBoost and added yet another switch holder so I could control the on/off power from the side where all the cabling is located.